Welcome to Today@WKU, the daily newsletter from WKU Public Affairs, for September 25, 2018. WKU Forensics Team opens season as tournament host: The WKU Forensics Team kicked off its competitive season by hosting the WKU/Alumni Fall Forensic Tournament on WKU’s campus the weekend of Sept. 21-23. WKU to bring VeoRide bike share to campus: VeoRide has officially inked a deal to be the exclusive provider of a micro-mobility fleet of bikes to WKU. Micro-mobility includes all modes of short-distance transportation, including standard pedal bikes, e-assisted bikes and e-scooters. Provided at no cost to the University, the agreement initially calls for 180 seven-speed bikes featuring the WKU logo and colors, with the addition of e-assist bikes to the fleet in the future. 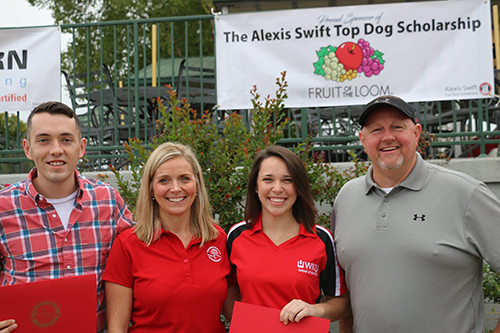 Alexis Swift Top Dog Scholarship Fund announces inaugural recipients: The inaugural recipients of the Alexis Swift Top Dog Scholarship were announced on Saturday at the 2nd Annual Alexis Swift Top Dog Invitational Golf Tournament. The first recipients are Casey Vanmeter and Marcus Todd. WKU Week in Photos: Sept. 17-21, 2018: Check out the latest installment of WKU Week in Photos by Clinton Lewis and Bryan Lemon of WKU Public Affairs on WKU's Facebook page. 'Words I Never Heard': WKU graduate to present Mary E. Hensley Lecture tonight: The Mary E. Hensley Lecture Series, hosted by WKU’s College of Education and Behavioral Sciences, will present Words I Never Heard by author and WKU graduate Lynnie Vessels tonight (Sept. 25). Women’s golf: Lady Tops Tied for Lead with One Round Left in Boston: WKU Lady Topper Golf is in the driver's seat heading into today’s final round of the Boston College Intercollegiate. The Lady Toppers finished Monday's first two rounds with a 36-hole tally of 607 (298-309), tied for the team lead with host Boston College. They're also second in the field with 21 total birdies. Volleyball: Bebout, Matthews Pick Up First Career C-USA Weekly Awards: For the third-consecutive week, WKU Volleyball has seen Lady Toppers earn weekly honors as Taylor Bebout collected the Setter of the Week nod and Lauren Matthews was tabbed the Freshman of the Week. The accolades are the first for both freshman student-athletes. Football: Weekly Press Conference: Coach Mike Sanford discussed the Hilltoppers’ win over Ball State and looked ahead to Saturday’s game against Marshall. Men’s golf: Tops' Outing at Bearcat Invite Canceled Due to Heavy Rain: With heavy rain falling in Cincinnati on Monday and more in the forecast, WKU Hilltopper Golf's third outing of the season at the Bearcat Invitational has been canceled. The Hilltoppers return to action at Georgia State's Autotrader Collegiate Classic on Oct. 15-16 in Duluth, Ga.
WKU dealing with key injuries going into Marshall matchup: WKU’s offensive lineup will be a mash unit of sorts come Saturday against Marshall. Second-year coach Mike Sanford confirmed Monday that both running back D’Andre Ferby and left tackle Cole Spencer are likely out this week. Quarterback Davis Shanley is still listed as the starting quarterback but still recovering from a shoulder injury sustained at Ball State. If Shanley can’t go WKU would be down to two scholarship QBs on the sideline Saturday. 3:30 p.m.: Pre-Law Admissions Forum. Faculty House. Contact Patricia Minter, (270) 745-5098. 6 p.m.: Presentation: Conversation with Artist Charles Brindley. Kentucky Museum’s Kentucky Room. Contact Kentucky Museum, (270) 745-2592. 7 p.m.: Cuban Film Festival: Guantanamera. Cherry Hall, room 125. Part of International Year of Cuba. Contact International Programs, (270) 745-5334. 7 p.m.: DiscoverWKU Hopkinsville. Holiday Inn Hopkinsville, 2910 Fort Campbell Blvd., Hopkinsville. Contact Admissions, (270) 745-2551.